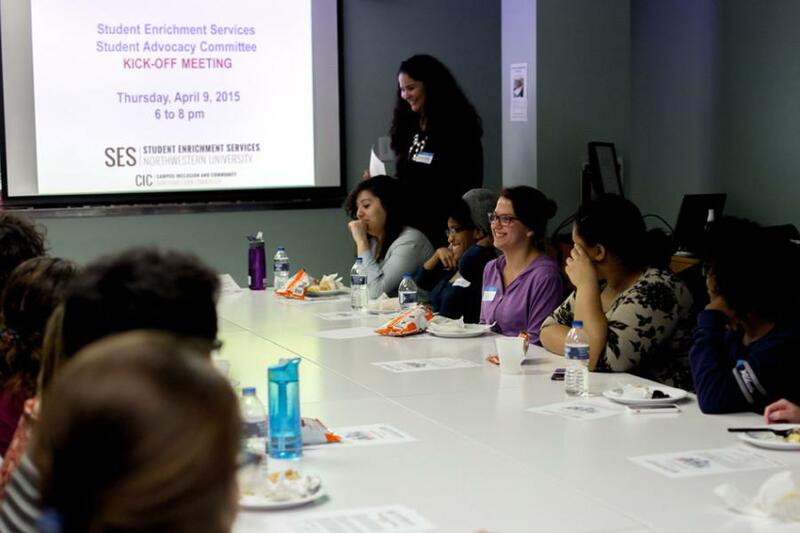 The Center for Student Enrichment Services holds a student advocacy committee kick-off meeting at Scott Hall in April 2015. This year, the center will implement changes in an effort to serve the needs of first-generation and low-income students. Student Enrichment Services has seen an increase of about eight student contacts a month to 64 a month in the year since it was created, SES director Kourtney Cockrell said. SES continues working on implementing changes in its programming in an effort to serve the needs of first-generation and low-income students, Cockrell said. “While this is exciting and positive, it’s also a challenge given the current staffing structure which includes my role (director) as the only full-time position within Student Enrichment Services,” she said in an email to The Daily. This summer, SES hosted two family events in Chicago for incoming freshmen that were also attended by alumni and staff, including Medill Prof. Ava Greenwell and Weinberg Prof. Frances Aparicio, Cockrell said in the email. The center also hosted two programs during Wildcat Welcome intended to provide information about academic and financial resources available to students and build a sense of community among them. Communication senior Amanda Walsh, president of Northwestern’s chapter of the Quest Scholars Network, said the center has started to become a safe space for first-generation and low-income students. The student advocacy committee, which was previously run by Quest Scholars, was transferred to SES last winter. The committee creates a space for first-generation and low-income students to discuss issues they face and enact ways to solve those problems, Walsh said. “The student advocacy committee will begin meeting this year to focus on programming and awareness raising of SES,” Cockrell said. “Programming will focus on financial wellness and career development, as well as a number of other relevant topics. Although the committee has not met yet this year, it will likely meet monthly, Walsh said. SES and Quest Scholars will also collaborate on creating a standardized application for scholarships and other funding opportunities so first-generation and low-income students don’t have to spend an exorbitant amount of time applying to individual programs, Walsh said. The program is scheduled to launch in Fall 2016, though testing and planning will begin in Winter Quarter 2016, Cockrell said in the email. The effort to create an online voucher program for first-generation and low-income students to purchase tickets to campus events while maintaining privacy about their socioeconomic status has taken longer than expected, said SESP junior Matt Herndon, Associated Student Government’s vice president for diversity and inclusion. The process is more complicated than simply subsidizing student groups that sell their tickets through the Norris Box Office because there are many other ticket-selling methods, Herndon said. “Ideally we would love to have (everything) run through Norris and student groups not have to pay the fee to run through Norris,” Herndon said. There is no timetable for when a voucher program will be complete, he said. Despite progress made over the center’s first year, Walsh said there is still work to be done. Another new initiative this year is the SES Peer Mentor program, which aims to help first-year students from low-income and/or first-generation backgrounds “feel an increased sense of belonging and connection to campus resources,” Cockrell said in the email. Under this program, which is already underway, first-year students will be matched with third- or fourth-year students from similar backgrounds and meet on a biweekly basis.